Our team of professional garage door repair specialists is available locally to conduct repairs and replacements for springs, openers, panels and more. With plenty of experience and a commitment to excellent service, our team of technicians is here to keep your door safe to use, and your home secure. Find out more about the following repair services by contacting one of our consultants today. 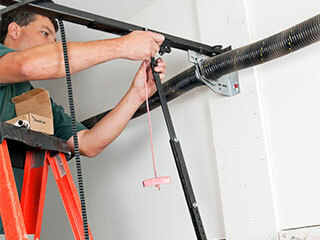 Many of the components of your garage door may be damaged during extensive use. The effects of harsh weather conditions and continual use will wear your door down and subject them to rust and corrosion causing them to ultimately fail at some point. This is why we offer garage door spring replacements, track and bracket replacements, and even replacements for openers, panels, and receivers. Garage door panels need replacing or repairs after long-term use. They may become worn with age or may face damage from unforeseen accidents. Whatever the reason for your door needing attention, our technicians can either replace or restore for you. Call us to find out more and have your door look brand new again. Let us help you to ensure that your door is being used safely by having us inspect, replace or repair the many safety features and components associated with it. Whether you need your sensors fixed, your reverse function tested, the balance aligned or your garage door cable repaired, we are here to assist you with making sure that each and every safety feature in your system is working to keep you and your loved ones safe. If you would like further details on our range of garage door repair services, contact one of our representatives at Garage Door Repair Winter Springs today or continue browsing our website for further information. All of our technicians are highly trained and experienced, which is why we are certain that we can give you the best, most professional garage door service. Give us a call today or schedule your appointment online!